The Rocky Horror Picture Show "sequel"
Shock Treatment was released in cinemas in 1981 and in 1983 a Laser Disc was produced here in the UK, one of the first titles on that format. There was also a laser disc release in Japan. A VHS video was also released around the world in 1988. Although crap quality pirate copies of the movie on DVD have surfaced on ebay, these were cheap rip offs from the video tape and no where near the standard of the laser disc. 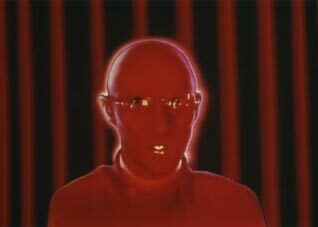 With this release of Shock Treatment 20th Century Fox have made a nice new transfer and it shows. Picture quality of the disc is stunning, bit rates don't drop below 5Mb and peak at nearly 10Mb, in other words you can see all the tassells on the pom poms in the "Denton" song. For those of you that finally want to see what a costume looked like in detail this disc is the answer to your dreams. The movie is presented in 1.85 format, more on that further in the review. The sound is listed as Pseudo Stereo. The sound mix is actually really good for a home cinema environment with a nice use of bass when needed. Where the disc could have done with some more input is the extras, all that is included is the original trailer for the movie, and then only in a 1:33 mono version. The disc is split into 32 chapters, but menus are static. I haven't found any hidden "Easter Egg" features yet, so if you spot any yourselves let me know. Additional audio features are limited to English only subtitles for the Hearing Impaired. There is no commentary track on this release. 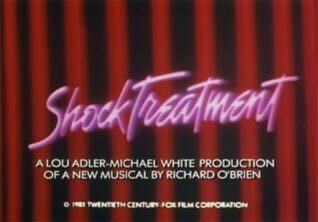 There was a nice documentary produced in the USA all about Shock Treatment and it is a pity that this was not able to make it onto the disc, if the history of Rocky Horror Picture Show releases repeats itself for Shock Treatment then expect to see a special edition in a few years time, I guess it's all down to a certain Mr Lou Adler again. 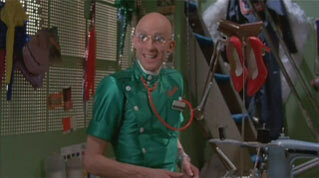 So overall, great picture quality and a decent soundtrack makes the DVD release of Shock Treatment one to buy. For those totally dedicated fans though there might just be a slight feeling that it could have included more additional content. Certificate: PG Dual Layer single sided disc 88 minutes running time. The main menu gives just four options for the disc itself. Play Movie - does just what it says on the tin. Language Selection - jumps to a sub menu shown below. Scene Selection - jumps to several sub menus shown below. Theatrical Trailer - plays the original cinema trailer, more details below. WWW.FOX.CO.UK just takes you to a static screen which says to visit fox.co.uk for details on releases, etc. All the menus are presented as shown above, the ones shown below I've cropped off the edges to speed up loading of the files for the site. Language options are just English for the Hearing Impaired subtitles which run across the movie itself and include comments such as (cheering) for background descriptions that are relevant to the story. The disc is split into 32 chapters. Please note there are no names as such for the chapters and the discs do not have the details on the packaging, the names below are either the songs or I have referenced the dialogue to describe the scene. 13. "Farley Flavor is fairly flattering"
19. "Out of self came selflessness"
23. "Wake up Janet, you've got guests"
28. Farley Flavors - "Faith Factory"
30. "Take no notice of him, he's mad"
Presented in 1.33 aspect (4:3 television format) the trailer is in mono and last 2 minutes and 31 seconds. This is where the famous quote "Trust Me, I'm a Doctor" comes from. A little more about aspect ratios for this release. 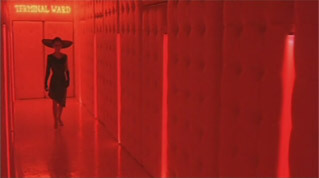 Widescreen releases of movies can be either the original widescreen as seen on the movie screen or in the case of movies that were originally less wide, for instance those in an "academy" format, letterboxed. 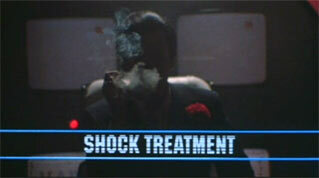 Shock Treatment on DVD is presented as a letterbox format release that is to say the top and/or bottom of the original image may be cropped off. This image shows the comparison between the widescreen DVD image and the UK laser disc image. The laser disc was in 1.33 format, the old 4:3 television standard. So then do you lose some image? Well going by the example above where I've overlapped the two images it would seem that you do in fact lose a little information, however look at the screen grab on the left. 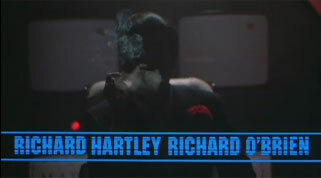 My laser disc copy and previous video releases always cropped the names to "ard Hartley Richard O'Br", losing some left and right details. So it looks like we are gaining some left and right information that would have been cropped for the older television formats and from the first few viewings of the movie we get the impression that there has been a lot of care taken to ensure important information is not cropped out if possible. Either way the movie looks so much better than the laser disc or video copies that personally I have no problem with how it is presented. All DVD images ©2006 Twentieth Century Fox Film Corporation. All Rights Reserved. © 2006 Twentieth Century Fox Home Entertainment, Inc. All Rights Reserved. All images used on the TimeWarp site with express permission. This page and information © TimeWarp 2006.